detail, gouache on paper. A favorite Guild model, one of several who will pose. I'm scheduled to teach two winter classes through the Richmond Art Center. Beginning Painting, Wednesday January 9– March 13 6:30–9:30 PM. A wonderful diverse group, many repeaters, working at their own speed. Some of the best painting days I've had have been in winter. Rain brings green hills and wildflowers. On a sunny day in a sheltered spot, the shadows are amazing. Of course, rain postpones class till the next week, but there are many sunny days in January, February and March. The class is for people who have painted, would like to try landscape, but feel they need help getting started, for people who would like to try a different approach to the one they have been using, or people who feel they know how to start but want help (or just input) getting past the start. I can offer tips on getting started with composition, color, and flow. It's all about the process. And how you can make it fit your abilities and inclinations. We visit places nearby, where there is a bit of wildness. As a rather lazy person, I tend to avoid long walks with heavy equipment. (The struggle to set up can get in the way of the art). There will be a demonstration, tips on getting started, help along the way, and show-and-tell. We'll go twice to a spot unless it's impossible because of wind or other issues. Communication individually by email so you get the right equipment and materials from the get-go. If enough people want to try locations farther away, we could make a trip to Mt Diablo or China Camp, both State Parks. The 8 week series will be $250. There will be 2 or 3 makeup days for those who have to miss dates.. Send a message through contact menu if you are interested. inky and Joan, collage and gouache, 2017, 22" x 15"
Inky and Orna, collage with gouache, 2017. 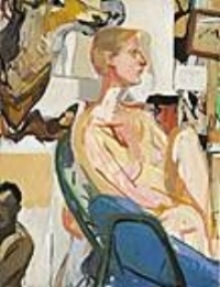 One of many figure pieces to see during four days of Open Studio. Saturday and Sunday, June 2–3 and 9–10. Garden gate opens at 11, closes around 6. Come share the fun, and hang out in the sunny-shady garden. I’ll have noshes and music. Berkeley, near the Albany border at Washington Avenue. 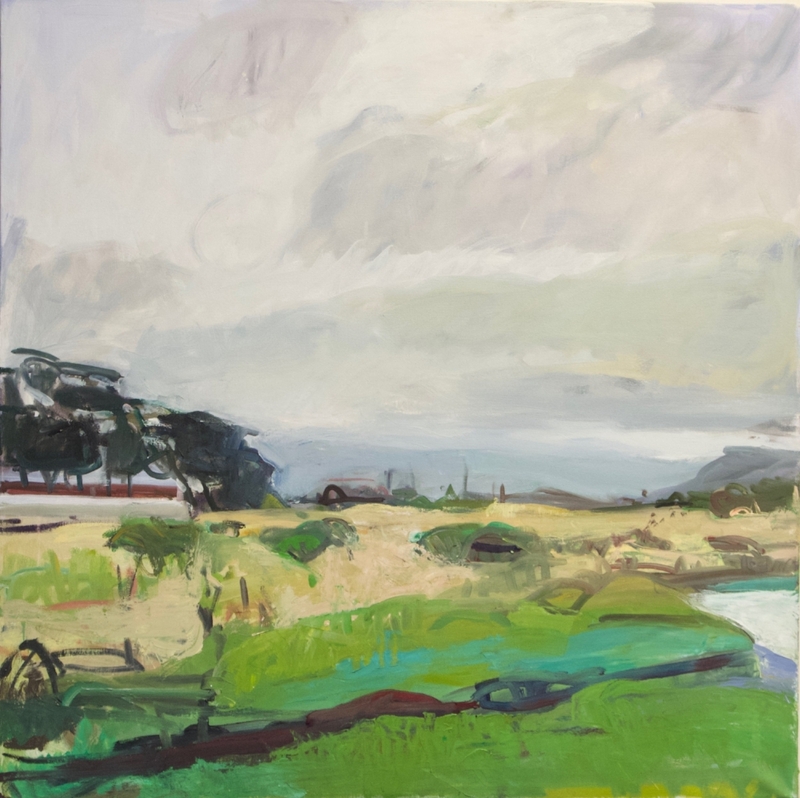 Fog Clearing, December Marsh, oil on canvas, 30" x 30"
Juror Emma Acker, American Art curator at the De Young chose the works on view at Bay Area Life 2018, at Valley Art Gallery in Walnut Creek. She chose my piece as her favorite, but there were lots of great pieces. Mona Chiang came to the studio to talk about the paintings in Road Trip, at Shoh Arts Gallery. The show went great, but it's down now. Here I'm talking about some of the pieces. Because all beings collaborate in our present moment, all parts contribute. Twenty four or so gouache paintings, some with collage, from weekly drawing sessions with model and friends. Lots to see: The garden, recent small & mid-sized l landscapes, fun figure gouaches and tiny bird paintings. I'd love to visit and get your feedback! or people who would like to try a different approach to the one they have been using, or people who feel they know how to start but want help (or just input) getting past the start. I've been painting outdoors since 1978, in oils and watercolor. Mostly my work is driven by a feeling for the space and liveliness of a scene. I can offer tips on getting started with composition, color, and flow. It's all about the process. I plan to take people to places nearby, where there is a bit of wildness, but also a bit of city. As a rather lazy person, I tend to avoid long walks with heavy equipment. (The struggle to set up can get in the way of the art). There will be a demonstration, tips on getting started, help along the way, and show-and-tell. We'll go twice to a spot unless it's impossible because of wind or other issues. We can communicate individually by email so you get the right equipment and materials from the get-go. If enough people want to try locations farther away, we could make a trip to Mt Diablo or China Camp, both State Parks. The 8 week series will be $190. Want to give it a try? It could be fun. I would love to hear from you if you are interested. You can enjoy a great burger or fried oyster Po’ Boy while checking out 11 of my figure gouaches displayed around the room at Meal Ticket restaurant in Berkeley. It’s a breakfast and lunch place, casual but tasty. If you decide you love one or two of them, they are available, all at the same price of $400. Contact me via email using the link on the “about” page. Our Monday East Bay Landscape Painters are putting together an exhibit of work painted in Berkeley. Several of my pieces will be showing. It should be lots of fun, with all sorts of locales and styles represented. The show starts September 13, with a reception Friday, September 20. See you there! Recently I complained to a group of friends that something was missing in my artistic life: A permanent studio for live figure drawing, where the fun creative setups could remain and evolve, artists could get together to explore changing themes, and different approaches to working from the model could be explored. Wei piped up that she had half a warehouse space that wasn’t being used; would I like to try something there. When I found out it was near I-80 on Gilman, had natural light and its own parking lot, I got really excited! That’s how we started. Wei and I want it to be the place where local artists can meet, learn, and evolve their ideas. My friend Mary Armentrout and her dad, Steve Armentrout have a personal gallery open Sunday afternoons, 2–5 PM. It’s at Steve’s house on Blake Street in Berkeley. That’s 1518 Blake Street at Sacramento Street, Berkeley. They’ll have my landscapes up through August 24. We’ll have a little closing party that afternoon, if you’d like to visit. The Berkeley Civic Arts Committee chose 31 artists to exhibit at City Hall in the coming year. I was honored to be among them with two paintings. There will be a reception sometime this fall at 2180 Milvia, Berkeley. Au Naturel : 2012 Exhibit. Bonnie Laing-Malcolmson chose Sig and Friends for the Third Place award.